Cranachan is a classic Scottish pudding, using the finest local ingredients. As well as being delicious, it's a cinch to make - we're talking five minutes, tops - and it's a helluva fun to say, too! My recipe combines the ingredients before serving (and you can chill the finished puddings before you need them - just be aware that the oatmeal will soggify a bit), but you can also be super-Sluttish and simply bring the individual ingredients to the table and let everyone mix their own pud. Tell them it's the traditional way (it is) and they'll all lap it up. HA HA HA, no work for you! Use Scottish heather honey and Scottish raspberries if you want to be 100% authentic, but seriously (whisper it): who's going to know if you don't? Toast the oats in a dry frying pan over a low heat, until golden. Keep a close eye on them so they don't burn. Set aside to cool. Whisk the cream until it holds soft peaks. Fold in the honey and whisky. Mush up the raspberries with the back of a fork (keep a handful intact for later). Add the raspberries and the oats (keep about a tablespoon aside to garnish) to the cream and barely combine. 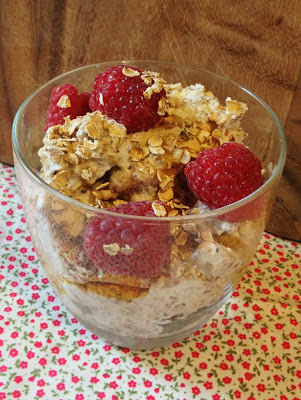 Spoon into glasses or bowls and top with a drizzle of honey, the rest of the oatmeal, and some raspberries.